Halloween has been fright night for most of us seniors since we were kids in the 1950s and early 60s. So what could be a better way to celebrate Halloween than an old scary movie? These 5 horror films seriously frightened me when I was a boy and still cause me to pull the covers over my head when I watch them today. The nostalgia factor of these films are sure to take you back to your childhood. And getting your wits scared out of you with your sweetheart next to you completes the night. You’ll keep poking each other in the ribs saying “Wow, remember this scene”? So grab the popcorn and jumbo soft drink as we take a stroll down memory lane. 1. Alfred Hitchcock’s 1960 Psycho is still the scariest movie for me because the first half of the film is an artful buildup to what many critics think is the all-time most shocking horror film scene ever. Hitchcock chose music that very clearly suggests to the viewer that they’re about to experience something truly dreadful. A young, beautiful woman steals money from the bank she works in and then speeds away to escape capture. She then checks into an out-of-the way motel on a back road far from the freeway and then meets the owner of the nearly defunct Bates Motel. Her skittishness and discomfort are clear omens of disaster to come. The shower scene, as well as several other subsequent scenes are classic Hitchcock lore that scared the pants off audiences when it was first shown, and many people even avoided taking showers for a while. I’ll bet many of us seniors still can’t watch this film without closing our eyes. 2. The Tingler, a classic 1959 horror film starring Vincent Price had entire theater audiences picking their feet up off the floor for the entire duration of the movie. Theaters even had some frightening special effects to enhance the film. I don’t want to give away too much of the plot, but suffice to say that the Tingler is about a dead body part that has been reincarnated and wants to crawl up the audiences’ legs and strike terror into their hearts. 3. The House of Wax, a 1953 chiller also starring Vincent Price was made at the beginning of the 3D movie phenomenon. 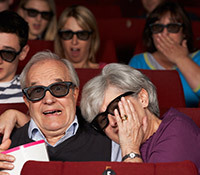 The scenes were so terrifying that audiences threw off their 3D glasses to escape the scariest parts. No actor knows how to scare the wits out of audiences like Vincent Price. This oldie but goody gets a thumbs up from me. 4. Rear Window, a 1954 Alfred Hitchcock, was one of those movies that built up so much suspense, you wouldn’t even consider getting up to go buy popcorn or even go to the bathroom. Rear Window stars Grace Kelley and James Stewart. The plot begins with a photographer sitting in a wheelchair due to a broken leg. The photographer begins noticing odd things going on at night from his apartment that overlooks a small yard. Raymond Burr brilliantly portrayed the psychopath killer. Entire audiences were on the edge of their seats ten minutes into the film and we never sat back until it was over. 5. Invasion of The Body Snatchers is a 1959 science fiction film, that, like most horror films, suggests from the first few minutes that something has gone horribly awry on planet Earth. And when people begin disappearing and then reappearing with the same bodies but startlingly different personalities it’s clear that anyone and everyone you know could be affected. Your mother, father, brother, sister, and best friend instantly become suspects. I can’t imagine a better reason for two people who care about each other to hold one another and try to make each other feel safe than having the daylights scared out of them for a few hours while watching old scary movies.